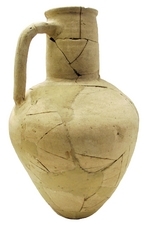 This type, is strictly speaking, more of a flagon than an amphora. It has only one long, vertical handle, attached below the rim and to the shoulder. There is a simple beaded rim, the neck is cylindrical, and the body ovoid, tapering towards a flat base. Late first century BC - first century AD. The only fabric noted for this form, the "black-sand fabric", suggests an origin from the bay of Naples region of Italy (see also chemical work by Thierrin-Michael in Martin-Kilcher, 1994: 383-4). This type has been found in Britain at Camulodunum (Hawkes & Hull, 1947: Pl. LXIX), Augst [Martin-Kilcher, 1994: 383-4) and Pompeii.